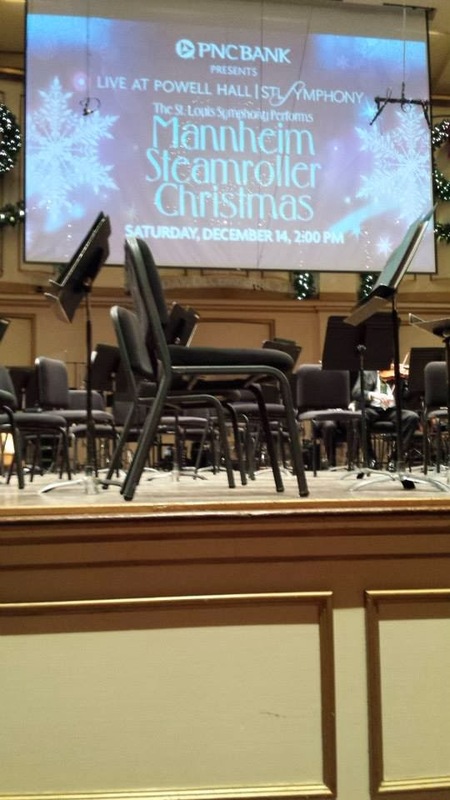 My wife and I went to Powell Symphony Hall to watch the St. Louis Symphony Orchestra perform “Mannheim Steamroller Christmas” on December 14, 2013. A college roommate introduced me to Mannheim Steamroller in 1982, one year after the release of their “Fresh Air IV” album. I was hooked. They combined classical music (particularly baroque) with jazz and rock into a light-progressive instrumental style. It featured Chip Davis, the founder, on drums, Jackson Berkey on the various keyboards – from piano to pipe organ to, particularly, harpsichord, and Eric Hanson on bass guitar. Their music avoids labeling – it has been called everything from New Age to Baroque-and-Roll (this label was first used on the group “The Left Bank” – a proto prog-pop band from the mid-1960s). The band does not embrace the New Age label, nor do most New Age enthusiasts embrace their inclusion into the genre. I am the exception. In the late 1980s and early 1990s I hosted “A New Age” at my local NPR station on Sunday nights. I happily included Mannheim’s music in addition to other artists outside the genre – Ravi Shankar, Isao Tomita and Blue Chip Orchesta along with stalwarts Kitaro, David Arkenstone and Enya. By this time there were surprisingly good so-called New Age music from the likes of even John Tesh and Barbie Benton. “Fresh Aire IV” combined medieval instruments on pop and rock arrangements of damnably catchy melodies. Ancient instruments playing tightly structured songs but with enough obtuse and unexpected variations on the melody to keep me listening. Four more “Fresh Aire” albums were to come – each album with a “theme”: the excellent “V” (a trip to the moon), “VI” (Greek Mythology), “7” (themes involving the number 7 – 7 seas, 7 chakras, Sunday, and “8” (infinity) – these last two reaching Number Two on the newly-created New Age charts; the only chart their music would seemingly fit. In 1984 Mannheim Steamroller released a Christmas album. For this ensemble known for its quirkiness and undefinability to enter the realm of Perry Como, Johnny Mathis and Percy Faith was the last thing one would expect – so of course it was a natural thing to do! Jazz musicians have released Christmas songs for decades, and there have been Christmas versions of electronic music; but for a still-obscure musical group to release a Christmas album was a substantial financial risk. Would those who enjoy traditional Christmas fare buy an album from this eclectic group? Would fans of this eclectic group buy an album of traditional Christmas fare? Fortunately for Mannheim Steamroller, both groups did. That first album “Mannheim Steamroller Christmas” was done in their unique style while still respecting the traditions of Yule. It spawned twelve other holiday albums with tunes ranging from original compositions to “You’re a Mean One Mr. Grinch”. They have sold in the millions and over the past thirty years the songs are considered Christmas classics. I saw Chip Davis and company perform their Christmas and Fresh Aire tunes in Chicago in 1987 on their first tour. They’ve toured at Christmastime regularly ever since – the band now down to Chip Davis, various session men and orchestras big and small. In October I was looking at what was happening in St. Louis during the Christmas season – perhaps we could see “A Christmas Carol” being performed, or a madrigal or a special concert. Perhaps the Nutcracker. “Elf” was playing at the Fox. Nah. No special individual Christmas shows were announced yet – not even Trans-Siberian Orchestra (another eclectic group – although firmly ensconced in the rock idiom – that had taken some of the thunder from Mannheim’s Christmas popularity). The St. Louis Symphony was going to perform a Gospel Messiah during the week of December 7th and their traditional Christmas program on the 21st. But the weekend of the 14thwas set for the Music of Mannheim Steamroller Christmas. I misread it at first and thought it was Mannheim Steamroller performing with the Symphony. Stop right there. We have a winner. My wife was excited too – especially since there were still front row seats available. A closer look shows it was not Mannheim Steamroller themselves (or himself – the “group” is now solely Chip Davis’s baby) but the St. LouisSymphony performing its music. The conductor/arranger of the concert program was Arnie Roth, the orchestral arranger for Mannheim Steamroller for many decades; so there was at least a connection with Chip Davis. He was there in spirit. I was interested in seeing how the orchestra would handle some of Steamroller’s electronic doodlings: the synthesizer intro to “Deck the Halls”, the mechanics of “Little Drummer Boy”, the swirling ending of “Silent Night”. I needn’t have worried – the strings (cello and bass violin in particular) handled the “Deck the Halls” intro, for example. We sat right in front of the violins. I was enraptured by their ability and talents. Throughout the concert the violins played in the quiet, serene background. When they took the lead of a song – they were majestic and moving. There are no bad seats at Powell, but one unfortunate side effect of the front row is we could watch the violinists play masterfully at the cost of not seeing anyone else. The brass, percussion, harp and piano/harpsichord were heard but not seen. I could spot one trumpeter between the legs and feet of the viola section, but that was it. And unfortunately the brass, percussion, harp and piano/harpsichord were the main instruments in the concert. From the intro of “Hark the Herald Trumpets Sing” I knew I was missing watching professionals playing excellent music. I didn’t mind though – I got to observe the entire violin section. I have been tinkering with the violin for many years and, as with guitarists, I loved watching their playing techniques. So next time we’ll sit a little further back. There were only a few sour notes – twice from the brass section. A missed note and an early intro; I have already forgotten which songs because frankly, I didn’t care. The drummer did an excellent job keeping the beat, but there were times he lagged behind the rest of the orchestra; I think it was during “Joy to the World”. Again, who cares? It did not distract from a superb show! During the 1987 concert, Mannheim performed the Renaissance version of “God Rest Ye …” and broke into “The William Tell Overture” between lines. I was hoping for the same here, but they did not. The smiles in this concert came not from humor but from enjoying superb musicianship playing superb arrangements. My wife and I enjoyed our evening at Powell very much! During the intermission the line to the rest rooms were in the dozens. I told my wife I would chance it and miss the beginning of “Deck the Halls”. Don’t worry, I said, we’ll hear it on the radio on the way home. Over the years the various Mannheim Steamroller Christmas albums have not been played on my stereo. They are played on the radio at Christmastime – a lot. A lot. But this concert gave me a new appreciation of the music from the albums and their quirky arrangements. Here we heard these quirky arrangements done in a very traditional way with a fine, fine orchestra. Loving this concert made me love the original arrangements as well. I even dug out my old Fresh Aire CDs to play in my car and in the 5-CD changer in the living room. Welcome back to the rotation, my friend. I had forgotten how much I missed you. Christmas Eve day we saw a 10:00am showing of “The Hobbit: The Desolation of Smaug”. The theater was full but not packed – with plenty of spare seats for our coats and colas – and but for a dweeb constantly texting in the row in front of us, it was a pleasant experience. Don’t worry; he finally stopped after I someone hit the top of his head with a kernel of popcorn. I liked the movie. I didn’t like it as much as the first Hobbit movie – “An Unexpected Journey” – for two reasons: the darker tone made it less likeable (although not necessarily less enjoyable) and the cliffhanger ending. The latter first: This would be a no-spoiler review, but there is nothing to spoil. It ended abruptly with no resolution. Some of the audience gasped and groaned. Really, folks? In this day and age in our State of Moviedom you are still surprised when the second film of a trilogy ends with a cliffhanger? The second “Matrix” and “Pirates of the Caribbean” ended the same way: lots of characters and plot points with nothing resolved. Bad move, I think. Although there may well be people who will see the third movie without first seeing the first two, they will be lost. Lost. “They started the movie with the final reel,” we would have said in the pre-digital age. It is a darker movie than its predecessor. While this is not a bad thing, it does take away the fun that underlay the first movie. In “…Unexpected Journey” we got to return to Middle Earth and meet friends we thought we never would again – Bilbo, Gandalf, even Elrond. Plus we were introduced to more dwarves – eating, drinking, singing, belching and full of life. They were on a quest to reclaim their kingdom and we went along happily. Aside, but not a spoiler: Tolkien mentioned in his notes and other references that Thror, King Under the Mountain (Thorin’s grandfather) owned one of the seven Dwarven Rings of Power that gave him his uncontrollable lust for riches, which thus led to the downfall of the race. I have been waiting for a reference to that in the movie. If it is revealed in the third film, slated for July 2014 and tentatively called “There and Back Again”; you heard it here first. The movie is dark because the theme throughout is desperation. They get refuge from the orcs at the home of Beorn, a skin changer. We despair for him as he is the last of his race. We care for this new and powerful ally. Gandalf leaves the party as they enter Mirkwood. In the book we learn he leaves to fight the Necromancer; in the movie we see the first part of that battle. Gandalf and Radagast go to the prison/tomb of the Nazgul/Ring Wraiths. They have escaped – more likely they have been released. Gandalf goes alone to Don Guldur to battle the Necromancer, whose identity is revealed. It ends with Gandalf pinned to a wall surrounded by an orc army and the Necromancer. The dwarves are caught by the Mirkwood spiders in a scene very much like the novel, a unique thing so far in the movie adaptations. Then on to the elven kingdom in Mirkwood (I can’t find its name on the internet) where we meet its king, Thranduil. He is desperately protecting his kingdom from the approaching murk – the spiders are but a sign of greater evil to come and he eventually closes his kingdom to outsiders. Thorin’s quest is folly, he believes, and will bring only additional woe to the world. The dwarves escape in barrels as per the novel and after another run-in with the orcs make their way to Laketown with the help of Bard. The people of Laketown despair under an autocratic regime; the Master of Laketown (played with oily glee by the wonderful Stephen Fry) is desperately trying to keep control of Laketown despite rumors of … elections?! And Bard despairs over his life and family – he is on the Master’s naughty list and has the stigma of being descended from the man who should have destroyed Smaug but could not. The dwarves make it to the secret passageway into the Lonely Mountain and despair that they cannot find the opening before their time expires. You feel their sadness and desperation as they realize their quest has sunk along with the setting sun. Once Smaug is revealed, we despair with Bilbo – how will he make it out of Erebor alive? We cheer the dwarves’ battle with Smaug, but do we honestly think they even have a chance? Hence a movie much darker than its predecessor. The film covers six chapters and (in my edition) one hundred and eleven pages of the novel. The movie clocks in at one hundred and sixty minutes. That’s about as long as it would take to read one hundred and eleven pages. As with the previous movie, there are plentyof scenes not from the book. As I mentioned in my review of “…Unexpected Journey” http://michaelgcurry.blogspot.com/2013/01/the-hobbit-expected-movie.html, I don’t mind that. Two reasons: 1) anyone who goes to movies nowadays expecting a word-for-word re-enactment of a novel might as well stay home – why do people like that go to movies anyway? Stay home and yell at the clouds. It will have the same effect and results; and 2) I enjoy any excuse to stay in Middle Earth. Peter Jackson keeps the feel and flair of Tolkien’s invented world in his new material. Fear not – we are in good hands. The biggest news before the movie release was the introduction of Tauriel – the head of the Elven guard of Mirkwood. She and Legolas are … kind of … romantically linked. Much was also made of Legolas appearing in the film. Of all the characters from “Lord of the Rings” to appear in The Hobbit trilogy, he is the most canny – this is where he lived, his father is the king, he would have been alive during the events of the Hobbit, so why not? Orlando Bloom is obviously older and a little thicker in the face here, but that is a minor quibble. His character is also darker and more cynical – in keeping with his father and his kingdom’s mood. Perhaps his time with the Fellowship revived (or created) a confidence for and loyalty with other races. The orcs continue to torment Bilbo and the dwarves even in Laketown. In the Lord of the Rings movie trilogy we had the “Elf Break”. Anytime there were scenes with Arwen or other elves it was a fine time to go to the bathroom, get a refill of popcorn and drink, go smoke, make a phone call, and so on. In the Hobbit movies we have the “Chase Break” – anytime there is a chase scene one can find time to do the same. The chase scenes are overlong – those criticisms are correct. Thrilling? Yes! Can be done in half the time? Yes. Oh, I miss some fine special effects and CGI acrobatics, but if ya gotta go ya gotta go! And I don’t miss much of the plot. “What happened?” I asked my wife when I got back from the potty during the orc battle/barrel scene. “This,” she gestured to the screen during the final moments of the orc battle/barrel scene. Much is made of Bard’s sneaking around Laketown with the dwarves. Spies were everywhere and the Master and his lackey showed themselves as self-preserving minor villains. Funny how the dark aspects of the movie truly reared their heads when humans entered the movie. Not so funny, really. And the battle with Smaug in Erebor was thrilling. The dwarves fought valiantly and Thorin’s idea as to how to defeat Smaug is obvious but done well. If you read the book, you know how successful they will be in defeating Smaug, but you will cheer them on and catch yourself hoping they succeed – which is the point. The dialogue between Bilbo and Smaug is overlong and overwrought. But it was that way in the book, too. You don’t think Peter Jackson would miss not filming the only unnecessary lengthy part of the novel, do you? Fili received a near-fatal wound and had to stay in Laketown with his brother and Tauriel. There is the beginning of a romance between them in the best Florence Nightingale syndrome. Legolas, you can imagine, seethes at the budding affection between elf and dwarf. Speaking of Legolas, he is last seen following the orc band out of Laketown. How much of the third movie will be dedicated to his plot thread? 2) The obvious foreshadowing of what will happen in the third movie. When Smaug first attacked, the only things that could pierce his hide were Black Arrows (harpoons) shot from special harpoon guns. The rumor is that one Arrow managed to flick off a piece of Smaug’s armor. But the person in charge of shooting the arrows, Bard’s ancestor, failed to kill Smaug. The citizenry of Laketown still blame Bard. One harpoon gun remains and it is revealed Bard still keeps one last Black Arrow. Gee, do you think he will ever find the opportunity to use it? Against … Smaug perhaps? Will he be able to find that one sweet spot and redeem himself and his ancestor? If this were marching down Main Street would the answer be more obvious? Minor quibbles really, in the face of a masterful movie. Go see it and enjoy it!